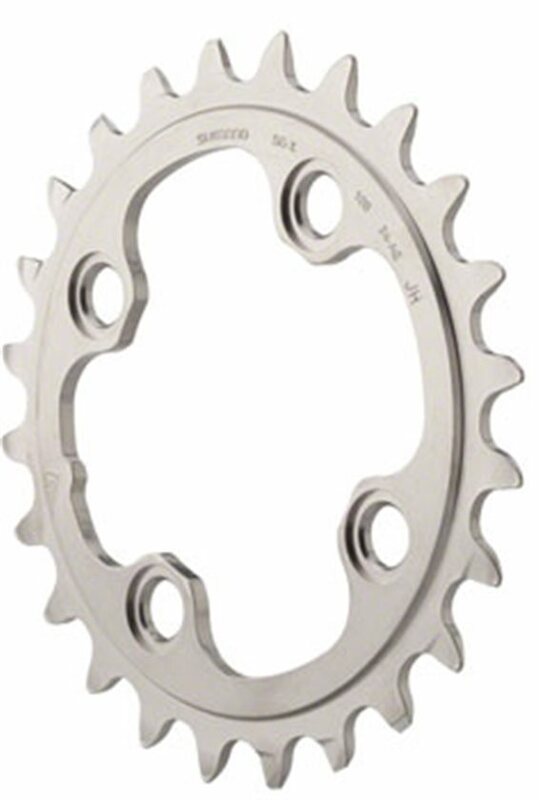 These are replacement chainrings for the Shimano XT M785-series Dyna-Sys 2x10 crankset. 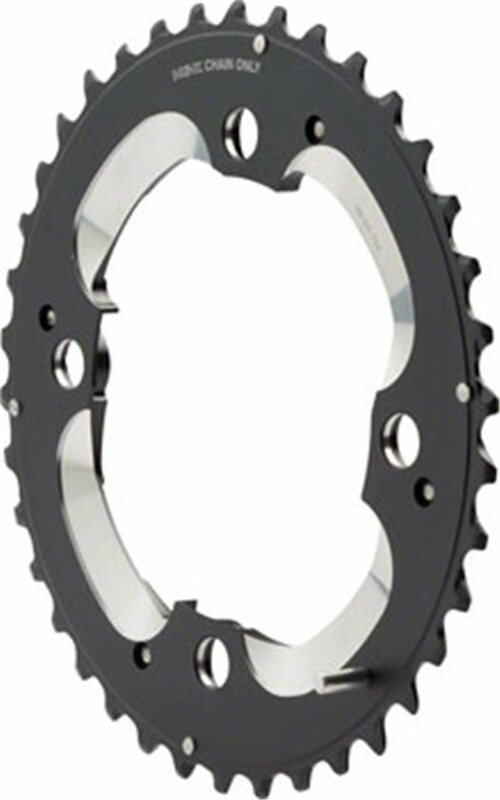 The Shimano XT M785 Chainring uses a 4-bolt 104/64 BCD pattern. These rings are for the AM 38/24T chainring configuration. Shimano recommends this ratio for superior shifting. It took some fine tuning and is working great. So, apparently this was a 9 speed chain ring. My setup is an XT 10 speed crank, XTR front derailer, and SLX shifter with 27.5 wheels. My big ring is a 38. The jump from a 22 to a 38 is pretty big. My thumb gets a work out making it happen. However, I was able to set it up so that there is no chain rub against the derailer on any gear. Why, I weigh 225 and this course I'm riding for 50 miles has a lot of long steep climbs. I kept running out of gears and blowing up my legs. Now it is better. Old chainring was worn and shifting wasn't as smooth. The ring was easy to replace and I didn't need to purchase the special tool to remove it. After taking the crank arm off (two torx screws), insert a large screw driver and turn to take the plastic retainer off. Then slide the chainring assembly off. Got a whole set: bottom bracket, chainring, cassette and chain. No problem with delivery. I bought the 38t based on the BCD of 104 thinking it would be universal. Alas, the bolt pattern is correct but the specific design of the flanges on the chainring make it Shimano specific. Won't work on SRAM. Ended up with TruVativ. It has become very clear that unless you know EXACTLY what you need, it is best to ask the techs if what you want to buy will work for your specific setup. Can't rate the chainring poorly. I'm sure it's fine for correct setup. 3 stars to alert others of potential problems. BTW, the 24t chainring I bouught fit fine. Product was the perfect replacement for the one I took off. Decent chain ring replacement. Very good quality for the price point. Just as described came ordered it at 5 pm showed up the next morning at 10 am. All from my work desk, faster than most bike shops. a bit pricy but you get what you pay for. smooth crisp shifts. I raced XC with this ring this past year (20+ races) and only recently had to replace it after wearing it out. For the price and how long it lasts, it's a great deal . I am running a 2x10 on my 29er. They provide a great gear range with the right cassette, much better than 1x's. These chainrings shift smoothly and are very efficient, no power lost here. Original part. I really wish they made a steel one so that it would not wear out so quickly. Would buy again. It was the right part that fit properly, no problems. Shimano, we all know the quality. This was a replacement, but my old one was so beat with so many teeth broken off, I was dropping chain at least 2X a ride. New, super easy to install, light, strong material and not a dropped chain since. I changed to a 24/38 combination for the Whiskey Off-Road in Prescott, AZ. I'm glad I did - there were some super steep and long pitches. Shimano may not be hi-zoot or trendy or pop-culture cool, but IT WORKS. When it is adjusted right it shifts quickly and quietly and does so time after time. Paired with a Shimano chain, it is the best shifting front gear choice available. Period. You may find some "pretty" anodized chainring or something from that "other" component supplier, but there is still nothing that performs as well as tried and true Shimnao. Get's the job done... And it's really well made. Delivery was prompt and it came in perfect condition. My handling leaves something to be desired, I usually smash body parts or bike parts off trees, rocks, etc. This is the second one I have purchased, the first finally needing to be replaced when I broke the chain. The chairing survived many meetings with rocks and logs with only minor damage, but still in working condition, much to my surprise at times. Obviously I would recommend purchasing as I have just purchased my second one, happy with the results of the first. Great part and long lasting. This chainring came as original equipment on my bike and is the primary gear that I ride in even though it is setup as a 2x10. It has lasted over two years and just starting to show its age. I will continue to use this as long as it is available for my current bike. My older XT components lasted for a long time. More recent stuff seems lighter and wears out quicker. Expensive if you don't get it on sale. Wears out fast if chain if chain is used beyond its life due to chainring being aluminum. I picked the wrong ring... so i can't say if it's good or not. Just be warned that there are all kinds of rings so you really need to know what you're picking. I made a noob mistake and am out $56 now :(. Will this chainring fit on a XT M780 10 Speed Triple Chain set as conversion to 2x10? BEST ANSWER: No, as the chainline for a triple crankset is not the same as a double crankset, meaning the front derailleur may not be able to accommodate the extra reach. Double cranks put the chainrings closer inboard towards the frame. You'll need to get a dedicated 2x10 crankset. Will this chainring fit a Race Face Turbine 2X crank? BEST ANSWER: AM, "All Mtn" indicates that this chain ring has fewer teeth, i.e. lower gearing than some of Shimano's other rings. This ring is designed to be used on the outside of a two ring, 10 speed Shimano crankset. It's marked on the outer ring. These are for a specific outer and inner gear tooth set. If memory serves am is the 38/24. I believe AM just stands for All Mountain which is based on the gear ratios bring more biased to climbing than top speed. I believe it stands for All Mountain type. Can I replace a 24 tooth chain ring with a 22 tooth chain ring on my 24-38 tooth, 2X10 crank? BEST ANSWER: Should be ok as long as it for a 10 speed chain and has a 64mm between the centers of the opposing screw hols on the the ring. Can I use this M785 38T to replace the 34T chain ring on a Shimano FC-M7000-2 chainset?